The Sun Yat Sen Nanyang Memorial Hall received an unusual visitor yesterday - a monitor sporting two long, vertical protrusions attached to a platform with wheels. Projected on the monitor was the smiling face of Madam Lily Wong, an elderly wheelchair user who struggles with dementia. The 92-year-old, who stays at St Andrew's Nursing Home in Queenstown, is on a virtual tour of the museum in Balestier, about 8km away and housed in the heritage building that commemorates the activities of the Chinese revolutionary leader Sun Yat Sen. 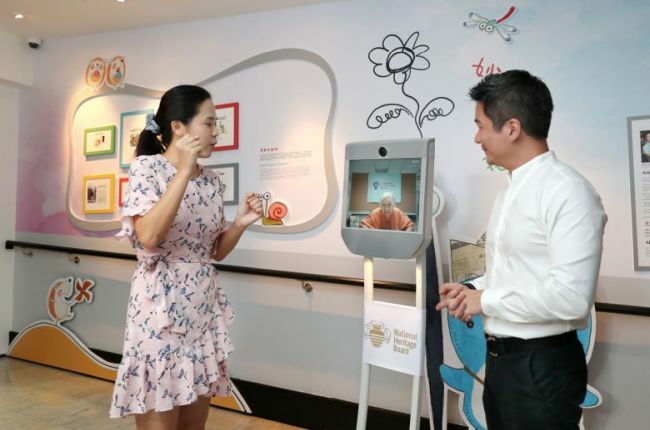 The remote-controlled mobile monitor, dubbed a Telepresence Robot, is part of the National Heritage Board's (NHB) "Be My Robo-Date" initiative, a programme that helps those who are physically disadvantaged to access its heritage institutions. "We wanted the robot to function as their eyes, ears and legs, giving visitors the autonomy to go at their own pace," said Mr Alvin Tan, the board's assistant chief executive, during a trial run of the new service for the nursing home. With the robot, a visitor needs only a device with a video camera and microphone, such as a laptop or smartphone, as well as Wi-Fi to go on a virtual tour. Each robot will be paired with a tour guide who will answer questions the visitor may have about the exhibits, producing an interactive experience. It has a zoom function too, that lets the visitor get a close look at artefacts. The Telepresence Robot is also equipped with an assisted driving function that adjusts its speed to the surroundings so that it does not knock into displays. It is the first such robot to be used in a museum in Asia. The NHB team was inspired by a similar robot used in the Van Abbemuseum in The Netherlands, which charges €70 (S$107) for an hour-long session with a tour guide. NHB, however, plans to offer the robot tour for free. "Our main objective is to reach out to under-served communities," said Mr Tan. The board also intends to make it available for online booking through the websites of three heritage institutions from June. These are the Sun Yat Sen Nanyang Memorial Hall, Malay Heritage Centre and Indian Heritage Centre. The board also wants to expand the programme to include prison inmates, terminally ill children and foreign workers, said Mr Tan. Ms Joan Lee, assistant director of nursing at St Andrew's Nursing Home, expressed the hope that the exhibitions, by engaging seniors struggling with dementia, will stimulate their memories of the past. Madam Wong, on seeing an exhibition featuring a series of illustrations depicting early Singapore, recalls migrating here from Shanghai at the age of nine. One of the colourful cartoons sparked a warm memory. "I remember seeing a kachang puteh man for the first time," she said, referring to the snack of nuts commonly sold by roadsides. "He was wearing that same headgear!"